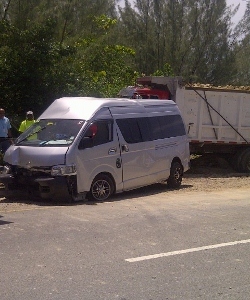 (CNS): A major collision on the West Bay Road between a mini bus and a dump truck loaded with fill caused traffic diversions this morning (Friday 8 June) as police closed the road. The crash occurred just outside Calico Jacks at around 10:15am when the two vehicles, which both appeared to be heading north, collided. A police spokesperson said no one was seriously injured in the crash but enquiries into how the collision happened are now ongoing. It is not known if the bus was carrying passengers at the time of the smash. Police re-opened the West Bay Road just before noon. I'm Sorry but something has to be done and done fast regarding the public transport who ever is in charge isnt doing his/hers job. These drivers feel that they an pull out in front of people or drive along side people to get in to the lane. Hopefully this one learned a lesson and if he didnt as the ole saying goes he must have got his sense lick out. What will happen when there is an accident on the only (new) road to West Bay????????? Just today alone I had one of the public buses think he had the right-of-way when I was turning right onto Mt. Pleasant and he was turning right onto Batabano Rd. He literally cut me off. On Eastern Avenue I had to slam on my brakes for another vehicle that did a U-turn at the light by the Texaco and laughed at me when I put my hands up in the air as if I was the person in the wrong. I have on several occassions been in a public bus which speeds, overtakes, U-turns and has absolutely no regard for the passengers in the bus nor the people he could potentially hurt with whatever illegal move he is doing. Agreed that the police have done nothing to control the situation so it's a free for all. I'm happy to hear nobody was killed as it could have been much worse. Perhaps it's to much to ask that the police control the traffic offences in addition to the robberies but seriously someone needs to pull them out of the air-conditioned offices and into the streets. Driving here has gotten to be way worse than any given day in a major U.S. city. Truly pathedic that those who make these offences think that wherever they are going is way more important than anyone else. How selfish and inconsiderate! Some of these truckers drive like berserkers right out of the Mad Max movie and the minibus drivers mostly got their licenses from a bubble gum machine so its a miracle no one was snuffed. The buses are always making U turns here it is an very dangerous practice and may have been the cayuse of this, I donn't know. I know there attitude is I am a bus I can do what I want. I call it the Big Mac attitude. This could have been a whole heck of a lot worse if he had not yet discharged his passengers – is that what it is going to take to have the taxis and buses clamped down on for their reckless driving and complete disregard for others on the road? I believe the new traffic regulations should hold drivers who ferry passengers for profit to a MUCH higher standard. There should be ZERO tolerance for dangerous driving. Any violation should be met with a license suspension – and injury or death accidents result in confiscation of vehicles. They are supposed to be AMBASSADORS of the road – not crazed lunatics doddging in and out, overtaking on roundabouts and dangerous stretches of roads, turning illegally and the list goes on!!! If an employee of any other company did not perform to a high standard, they would face punishment of termination – these bandits get away with murder – and before long, there will be tragic consequences. Police – you take rap for not doing anything, well here are a few golden nuggets that will put you out in front of the public, in plain view, and performing a service (with financial gains to government to boot). 1, Stand an officer by the museum who's sole job is to pull over drivers turning right while heading north on South Church Street drive. I would estimate between 10 to 20% of drivers break this clearly marked no turn sign. 2, Put a car on the bypass by Lakeside who just tickets drivers illegally turning into and out of the complex contrary to clearly marked signage and some very high profile accidents in the area. At least one of these regular offenders is a taxi driver who lives there I believe for the number of times I have seen them do it!! 3, Stick a cop at the round-about by Cost-u-Less to ticket the buses and occasional though not often, other drivers who feel they don't have to go around the circle but can bang a U-turn ON A ROUNDABOUT and into the flow of traffic!!! Crazy – and if you want proof – just check the tire tracks – it is done so often there are many many markings!! 4, A cop at Royal Palms and one by Treasure Island – the favorite overtaking spots using the middle lane for taxis and other drivers too!! 5, Actually ticket the drivers who stop in front of the Port blocking the flow – don't just move them along – make money off their flagrant disregard for others! 6, Station a cop on the round about by ALThompsons – the buses love to race the whole way around the outside lane – very dangerous – as they ferry passengers back to the ship down the bypass. The speeds they go and the angle of the lean of the vehicles is scary and it will only take a tap from a law abiding driver exiting within their rights to flip one on its side – that is coming soon, trust me!! There are too many close calls now. Great ideas. It would also be easy pickings to write tickets at any stop sign or stop light on the island. Most people seem to think they are suggestions rather than rules of the road. Great ideas! And then put one on Andrew Drive in Snug Harbour where they overtake one another whilst racing to turn onto Palm Heights and honking repeatedly to let pedestrians and other drivers know they are coming, instead of stopping and looking like everyone else has to do. The "no right turn" sign by the side of the museum is not there anymore. I'm not sure if the NRA changed their minds and are now allowing right turns or whether the sign wast removed by someone who wants to turn right. Can you check with the NRA to see which it is please? I sincerely hope no-one has been hurt or worse. It is a miracle that no one has yet been seriously injured or killed in front of Calico Jacks. The Police have turned a blind eye to the total free for all of tour busses, taxis, and cruiseship tourists clogging the West Bay road in front of this establishment. Now add fully loaded dump trucks to the mix and this extremely dangerous situation becomes lethal. I trust this will be a wakeup call for the authorities to get the precarious traffic situation that has been festering for years under control and safe.